The “Electoral Coalition”, set up by seven major parties and political groups at the meeting held in Pretoria, South Africa, from 23 to 25 October 2018, met again in Geneva (Switzerland) to nominate a common candidate for the presidential election of 23rd December 2018. At the end of 3 days of negotiations, four opposition leaders and presidential candidates in the DRC (comprising Fayulu, Kamerhe, Matungulu and Tshisekedi, in alphabetical order), on Sunday, November 11 2018, designated Fayulu as their common candidate. 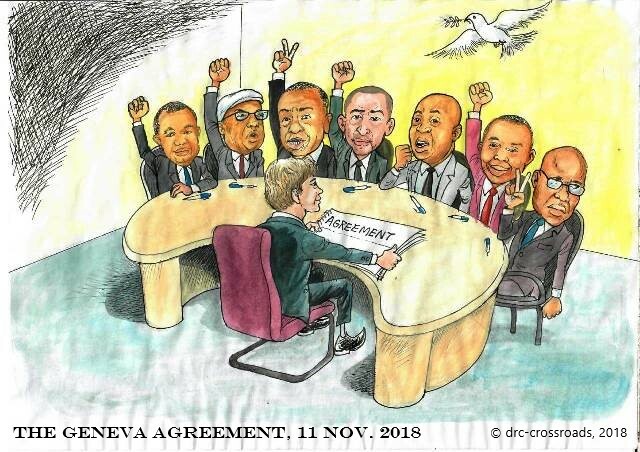 This designation was included in a political agreement, ratified by the four presidential candidates as well as Bemba and Muzito invalidated by the CENI, and Katumbi blocked from entering the country by the DRC government. 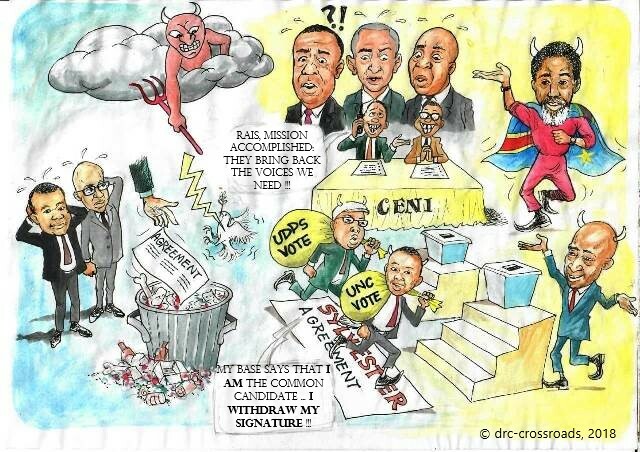 In less than 24 hours, Kamerhe and Tshisekedi disavowed their signatures under “pressure from their bases”. This reversal is a deplorable and shocking act; especially when the crumbling of the opposition will make the bed of the FCC and its candidate, Emmanuel Shadary. We hope that by taking such a serious decision, at this historic turning point in our fragile democracy, Felix Tshisekedi and Vital Kamerhe have taken stock of all the consequences on the outcome of the elections. Farewell to the 2006 Saint Sylvester agreement, the transfer of power and disrupture!!! Welcome to “mediocrity”, corruption, impunity, predation, bad governance, the violation of human rights; to name but a few, with Emmanuel Shadary, the FCC and the Demon-cratic Republic of the Congo !! !